It is so sad that we have failed to give true place in our history to Puru (Porus to the Greek), who fought Alexander of Macedon. We have instead through the years idolized the European invader. Not only that there was once upon a time some talk about letting the Greeks build a monument for Alexander on the banks of Jhelum. I doubt if the Greeks have any money to build any monuments. About Porus, the son of the soil our attitude has been mostly hostile and none of our historians have made any effort to set the record straight. In the Indian movie Sikander produced by Sohrab Modi (Modi plays the role of Porus) and released in 1941, the only concession given to Porus is the famous dialogue he delivers, when he is produced in shackles before Alexander: “Treat me as a defeated king should be treated by the victor.” Some took this as Porus’s desire to be killed. Even in this poignant scene, the Indian king is depicted as the loser and the European (played by the dashing Prithviraj Kapoor – the patriarch of the famous Kapoor clan of Bollywood), the gracious winner, who sets the defeated local satrap free. Interestingly though the British were so frightened that this film that coincided with the onset of World War II may arouse patriotic fervor against a foreign invader that they banned it from some of the theatres serving British Indian Army cantonments. Western historians have gone to great lengths in portraying Alexander’s invasion of India as a brilliant and methodical occidental victory over the disorganized orient. Recently, a friend provided me material throwing a fresh light on the encounter between Porus and Alexander. He quotes Marshal Gregory Zhukov, the famous Red Army general, who stopped the German Army in its tracks as it made bold inroads across the Russian steppes during the Second World War. In 1957, while addressing the cadets of the Indian Military Academy, Dehra Dun, Zhukov said Alexander’s actions after the Battle of Hydaspes suggest he had suffered an outright defeat. In his view, Alexander’s setback in India was greater than Napoleon’s in Russia. Only 30,000 of out of 600,000 soldiers comprising Napoleon’s invasion force survived and out of these fewer than 1,000 were ever able to return to duty. Axiomatically, therefore, if Zhukov was comparing Alexander’s campaign in India to Napoleon’s disaster, the Macedonians and Greeks must have retreated in an equally ignominious fashion. Zhukov would know a fleeing force if he saw one; he had chased the German Army over 2000 km from Stalingrad to Berlin. In 326 BCE a formidable army led by Alexander of Macedon invaded India. Comprising battle hardened Macedonian soldiers, Greek cavalry, Balkan fighters and Persians allies, it numbered more than 41000 fighting men. Their most memorable clash was at the Battle of Hydaspes (Jhelum) against the army of Porus, the ruler of the Paurava kingdom of western Punjab. For more than 25 centuries it was believed that Alexander’s forces defeated the Indians. Greek and Roman accounts say the Indians were bested by the superior courage and stature of the Macedonians. Two millennia later, British historians latched on to Alexander legend and described the campaign as great western triumph. Although Alexander defeated only a few minor kingdoms in India’s northwest, in the view of many gleeful colonial writers the conquest of India was complete. In reality much of the country was not even known to the Greeks. So handing victory to Alexander is like describing Hitler as the conqueror of Russia because the Germans advanced up to Stalingrad. Alexander’s troubles began as soon as he crossed into what constitutes modern day Pakistan. He first faced resistance in the Kunar, Swat, Buner and Peshawar valleys, where the Aspasioi and Assakenoi, known in Hindu texts as Ashvayana and Ashvakayana, stopped his advance. Although small by Indian standards they did not submit before Alexander’s army. The Assakenoi offered stubborn resistance from their mountain strongholds of Massaga, Bazira and Ora. The bloody fighting at Massaga was a prelude to what awaited Alexander in India. On the first day after bitter fighting the Macedonians and Greeks were forced to retreat with heavy losses. Alexander himself was seriously wounded in the ankle. On the fourth day the king of Massaga was killed but the city refused to surrender. The command of the army went to his old mother, which brought the entire women of the area into the fighting. Realizing that his plans to storm India were going down at its very gates, Alexander called for a truce. The Assakenoi agreed; the old queen was too trusting. That night when the citizens of Massaga had gone off to sleep after their celebrations, Alexander’s troops entered the city and massacred the entire citizenry. A similar slaughter then followed at Ora. The fierce resistance put up by the Indian defenders sapped the strength and the confidence of the Macedonian army. In his entire conquering career, the hardest encounter that Alexander came across was at the Battle of Hydaspes, in which he faced king Porus of Paurava, a small but prosperous Indian kingdom on the river Jhelum. Porus is described in Greek accounts as standing seven feet tall. In May 326 BCE, the European and Paurava armies faced each other across the banks of the Jhelum. By all accounts it was an awe-inspiring spectacle. The 34,000 Macedonian infantry and 7000 Greek cavalry were bolstered by the Indian king Ambhi, who was Porus’s rival. Ambhi was the ruler of the neighboring kingdom of Taxila and had offered to help Alexander on condition he would be given Porus’s kingdom. Facing this tumultuous force led by the genius of Alexander was the Paurava army of 20,000 infantry, 2000 cavalry and 200 war elephants. Being a comparatively small kingdom by Indian standards, Paurava couldn’t have maintained such a large standing army, so it’s likely many of its defenders were hastily armed civilians. Also, the Greeks habitually exaggerated enemy strength. According to Greek sources, for several days the armies eyeballed each other across the river. The Greek-Macedonian force after having lost several thousand soldiers fighting the Indian mountain cities, were terrified at the prospect of fighting the fierce Paurava army. They had heard about the havoc Indian war elephants created among enemy ranks. The modern equivalent of battle tanks, the elephants also scared the wits out of the horses in the Greek cavalry. Another terrible weapon in the Indian armory was the two-meter bow. As tall as a man it could launch massive arrows able to transfix more than one enemy soldier. The battle was savagely fought in the vicinity of the ancient city of Bhera. 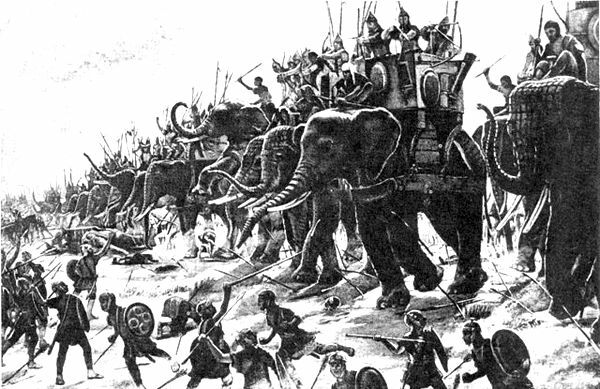 As the volleys of heavy arrows from the long Indian bows scythed into the enemy’s formations, the first wave of war elephants waded into the Macedonian phalanx that was bristling with 17-feet long sarissas. Some of the animals got impaled in the process. Then a second wave of these mighty beasts rushed into the gap created by the first, either trampling the Macedonian soldiers or grabbing them with their trunks and presenting them up for the mounted Indian soldiers to cut or spear them. It was a nightmarish scenario for the invaders. As the terrified Macedonians pushed back, the Indian infantry charged into the gap. In the first charge, by the Indians, Porus’s brother Amar killed Alexander’s favorite horse Bucephalus, forcing Alexander to dismount. Legend has it the Bucephalus is buried in the town of Phalia. This killing of the king’s charger was a big blow. In battles outside India the elite Macedonian bodyguards had not allowed a single enemy soldier to deliver so much as a scratch on their king’s body, let alone slay his mount. Yet in this battle Indian troops not only broke into Alexander’s inner cordon, they also killed Nicaea, one of his leading commanders. Indeed, on the other side of the Ganges was the mighty kingdom of Magadh, ruled by the wily Nandas, who commanded one of the most powerful and largest standing armies in the world. According to Plutarch, the courage of the Macedonians evaporated when they came to know the Nandas “were awaiting them with 200,000 infantry, 80,000 cavalry, 8000 war chariots and 6000 fighting elephants.” Undoubtedly, Alexander’s army would have walked into a slaughterhouse. Hundreds of kilometers from the Indian heartland, Alexander ordered a retreat to great jubilation among his soldiers. The celebrations were premature. On its way south towards the sea, Alexander’s army was constantly harried by Indian partisans, republics and kingdoms. In a campaign at Sangla in Punjab, the Indian attack was so ferocious it completely destroyed the Greek cavalry, forcing Alexander to attack on foot. In the next battle, against the Malavs of Multan, he was felled by an Indian warrior whose arrow pierced the Macedonian’s breastplate and ribs. The wound was so severe that it put an end Alexander’s career as a fighting soldier. Lung tissue never fully recovers, and the thick scarring in its place made every breath cut like a knife. Alexander never recovered and died in Babylon (modern Iraq) at the age of 33.